Johan and Malin joined us in the harbour at 11.00. They should be with us for a couple of days. 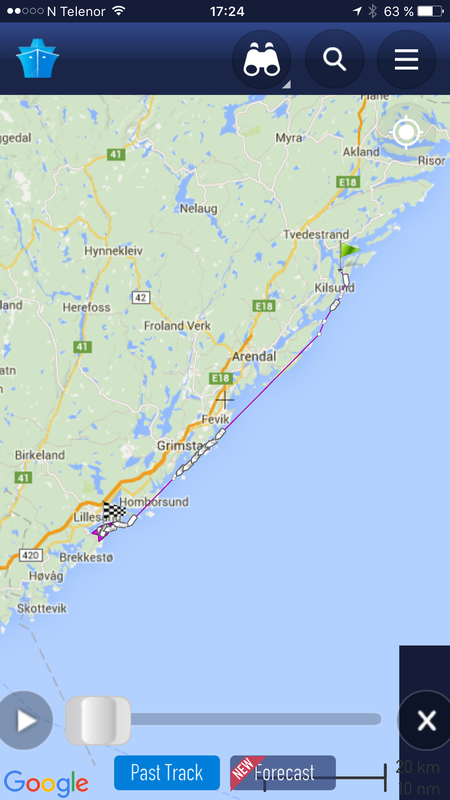 We cast off and used the engine through Soten and hsmburgsund but otherwise we sailed. 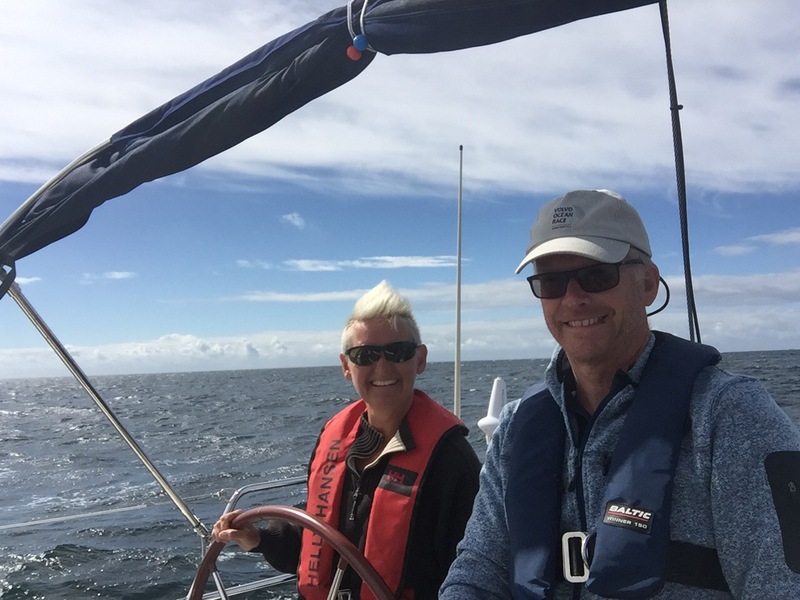 The off shore sailing west of fjallbacka and grebbestad towards havstenssund and our mooring in the bay of sannas was great. Wind peaked at 12 ms. The anchore lost grip at the first place we moored so we needed to change position. Second was great. Johan and Malin used the canoes while we relaxed. Bbq and drinks before bedtime. Johan and Malin started the day with using the canoes while I prepared the breakfast. Anna was still in bed so we wake her up when the breakfast was ready. 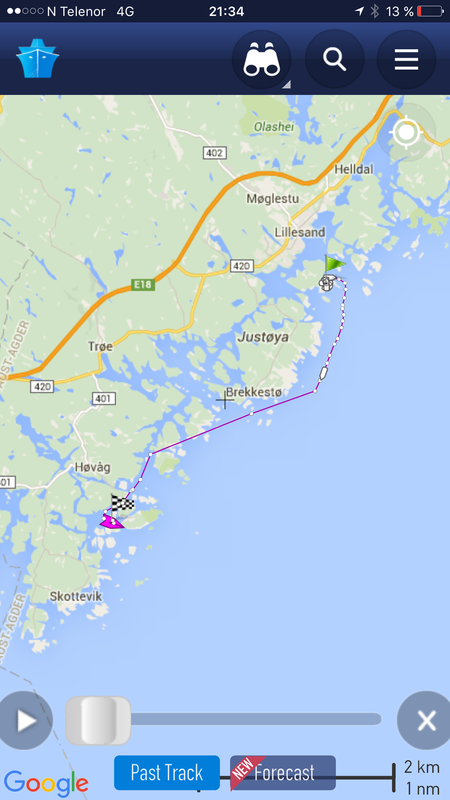 We had a nice sailing via Ekenäs before we docked at Nordkoster. I had a contact with the harbour captain (the same as last time we visited Stefan Gitje and the restaurant Galejen) so we got the same spot. We took a long walk around the west to north side of the island. During the way we discovered a campers that looked more or less that they were lost since the 60ths. The only thing we did not find was Maja :-). Stefan G helped us with a reservation at Galejen as his brother was working. 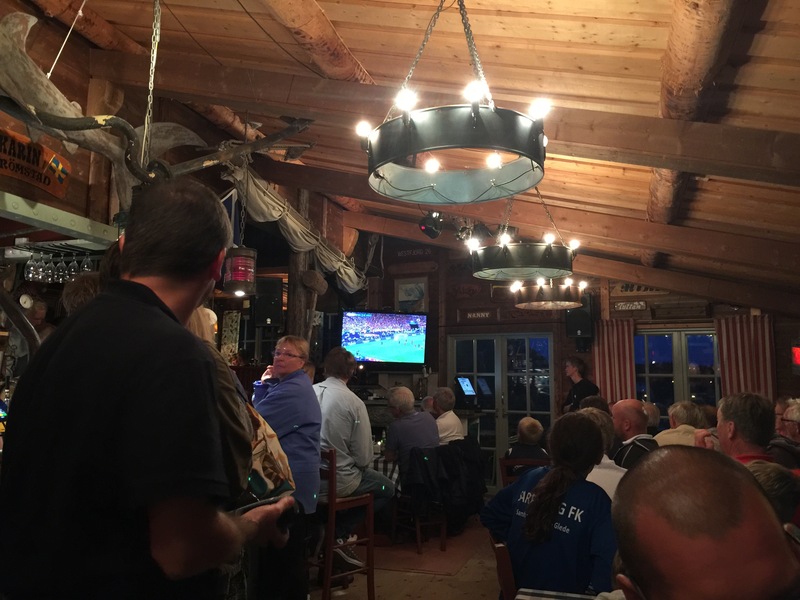 We had a nice dinner and watched EM football final. Portugal won towards France. Anna was disappointed. 11/7 Johan and Malin leaves. We had a great time together with Johan and Malin but now was the time for them to go back. They took the ferry at noon. Me and Anna took a long walk in the afternoon. Same as the day before. 12/7 crossing the Oslo fjord. The weather was ok with winds up to 9ms so we decided to cast off. We set the course towards Samö where there is a nice bay which we hoped was calm. The crossing went were well and we anchored in a good spot. Later in the afternoon I read that the wind should increase up to 12 ms and even if we were protected from waves I felt really nervous if the anchore should hold. It turned out very well and we had a calm evening reading books and writing this blog 😉 However the night …. We woke up after a crazy night. Both Anna and my self had slept very bad due to waves rolling into the bay. 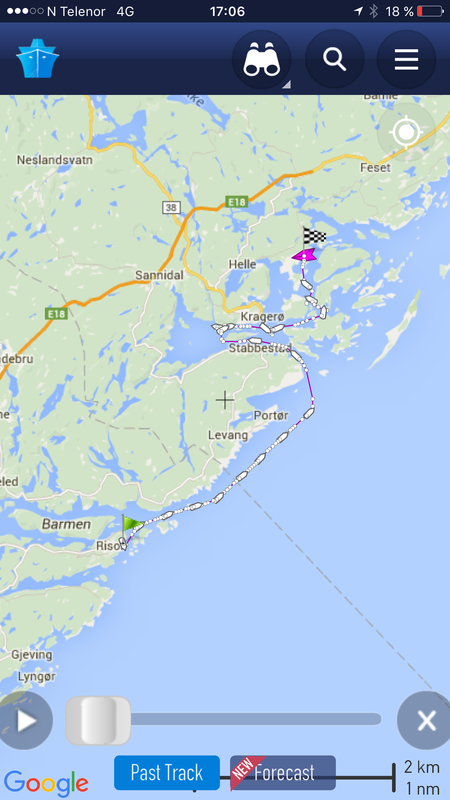 Sometimes completely calm and sometimes waves disturbing our sleep probably from ships in Oslofjord. At 5 a clock I decided to cast off. Anna was still in bed and I hoped she could sleep while I was driving west. So wrong !!! As soon as we got closer to verdens ende big wave met us so we went up and down. Anna came out very quick and stood by the rudder in many hours. She did not enjoy the waves, especially at Langesund were the warn for dangerous waves in the sea map. 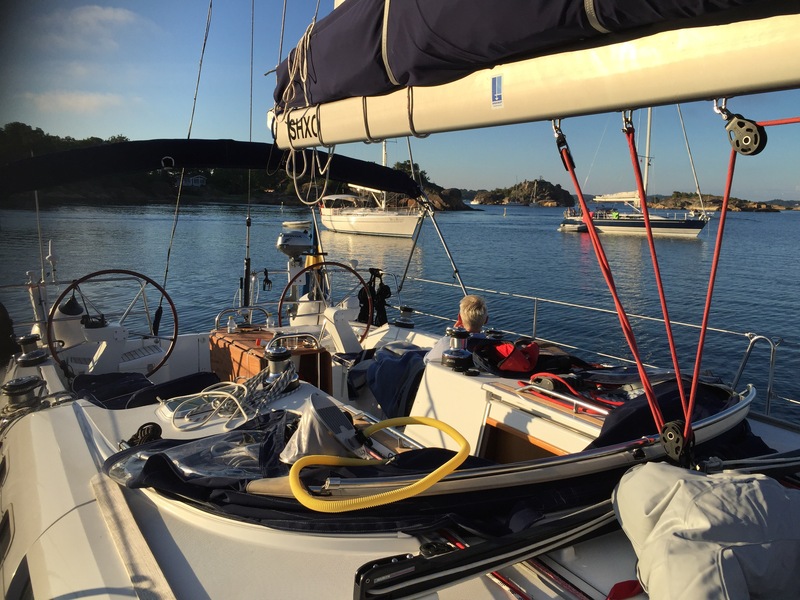 We approached Tvedestrand after 8 hours and got a perfect longside spot helped by an old Norwegian sailor. It almost immediately started to rain started so we put up the cockpit tent very quickly. As we spend many hours off shore in big waves yesterday we decided to relax and do nothing except walking in this beutiful village. The design of the White houses as the climbed up the hills was great to see. The rain did come and go most prabably because we was at the end of a fjord surrounded by hills. A very beautiful morning with blue sky. We cast of saying goodbye to a neighbour boat from Sweden (Najad 32). The owner was a retired fishing man. He and his wife have sailed up to lofoten. A three month journey . Again headwind so we used our yanmar going west. Nice weather and we felt a bit yealous of the sailors we met with nice wind from behind. We ended up in paradise bay close to lillesand were we anchored in the center of all other boats. Nice blue sky and headwind of 7-10ms. 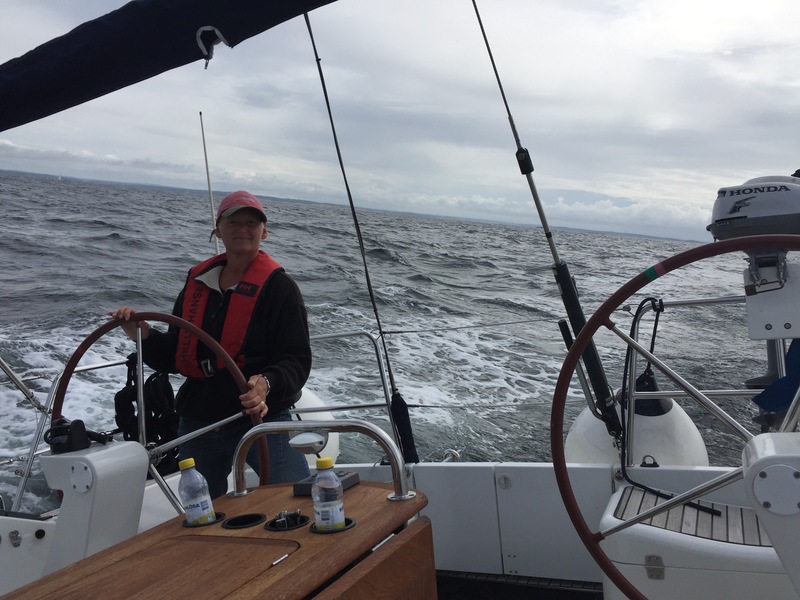 We decided to go the inshore course which was very nice. Some areas was very narrow and shallow and I was a bit concerned about the depth but it all went great. We docked long side a cliff behind some other sailboats who guided us very well. We prepared the rubber boat and drove around to explore the neighbourhood. 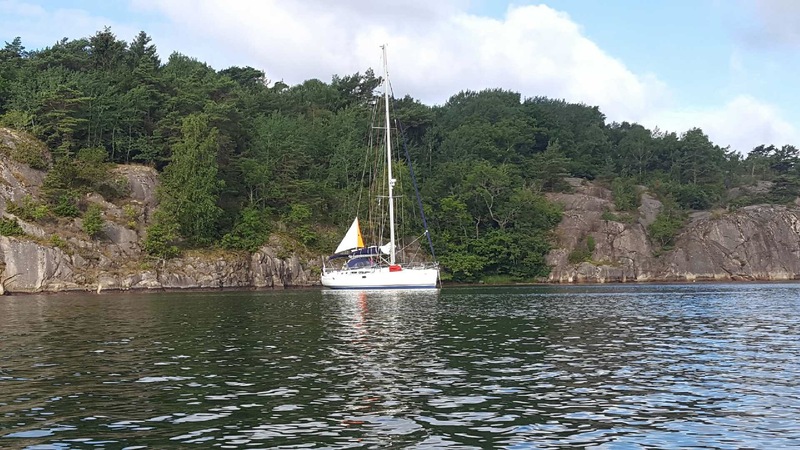 Our boat neighbour in Basteviksholmen have a summer hous in gamle … But we never found him. We cast of at 10 ich after having breakfast and preparing the ship. We went through gamle xxxx and horned 6 times to out neighbour at Basteviksholmen as we have promised. We thereafter set the course east off shore all the way to Grimstad. The wind was about 3-7 ms from behind so nice sailing with the genua. In the entrance to the harbour we find a que of motorboats and we asked them why. They told us the harbour was full. We called the harbour captain and he advices us to a spot were we docked together with other sailboats. We took a walk in the village in the afternoon e.g to the big tree church build 1881. Great church and view from the church hill. In the evening we went to an restaurant that was advised to us from a swede who was the the master chef. It was a nice pasta restaurant. Back into the ship we relaxed, me in the cockpit and Anna in the forward cabin. Nice weather but not much wind. 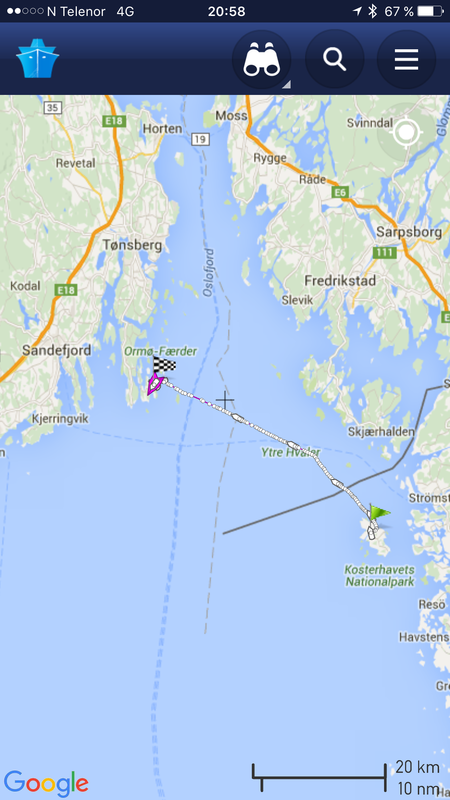 We set the course east and drove inshore at Arendal towards lyngör before we turned towards Risör. I called the harbour Captain to ensure we have a spot but when we arrived he was not in office and his successor was not of aware of my reservation. He manage to solve it anyhow. In the evening we too a walk around this nice village but also a long walk along the coastline. This took some time but at the same time we saw a fantastic view towards the sea. Back in the village we had some bears at a nice restaurant in the harbour and talked to a couple from Stavanger. Again nice weather and we cast off around 11 am. We had head wind in just a couple of ms do we drove with the engine. We tried to find a nice spot outside Kragerö but it took some time to find this very nice bay where we could anchore. Anna took a bath while I relaxed before we bbq. A very nice evening. Blue sky and almost no wind. Anna took a morning bath in approx 20 degree C.
We drove with the engine between beautiful island towards jungfruland before we were able to go off shore and set sail. 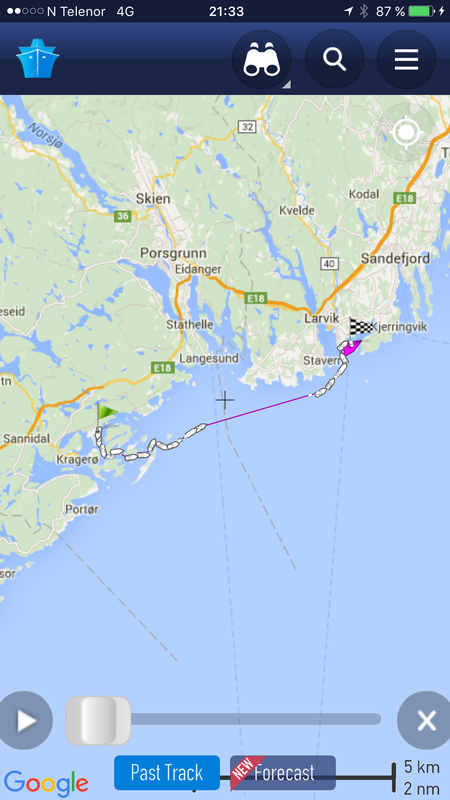 A very nice sailing in 5-7 ms took us to stavern and the island cross the fjord were we anchored. The afternoon and evening was very calm in a very nice and calm weather. We woke up with very little wind and nice weather. 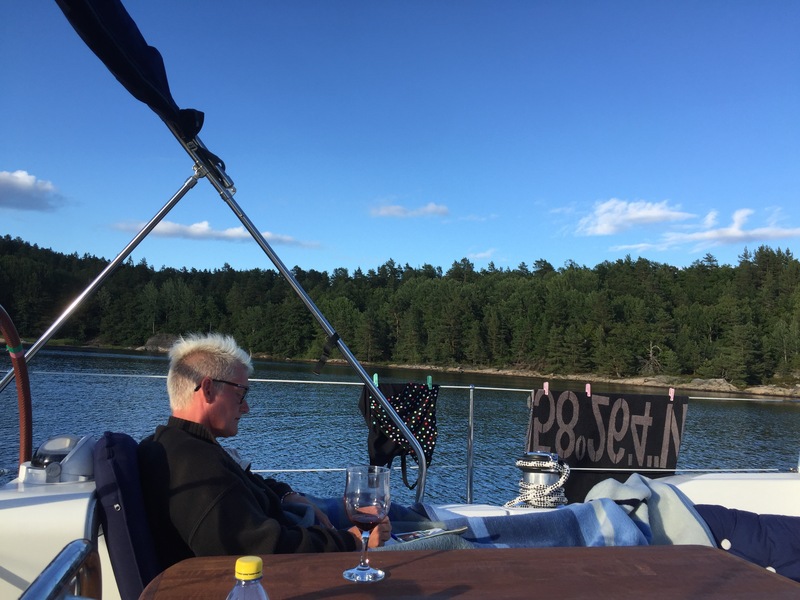 We relaxed and took a bath in the nice weather Before we set course straight towards Sandefjord. As we did not have any wind we used the engine all the way. 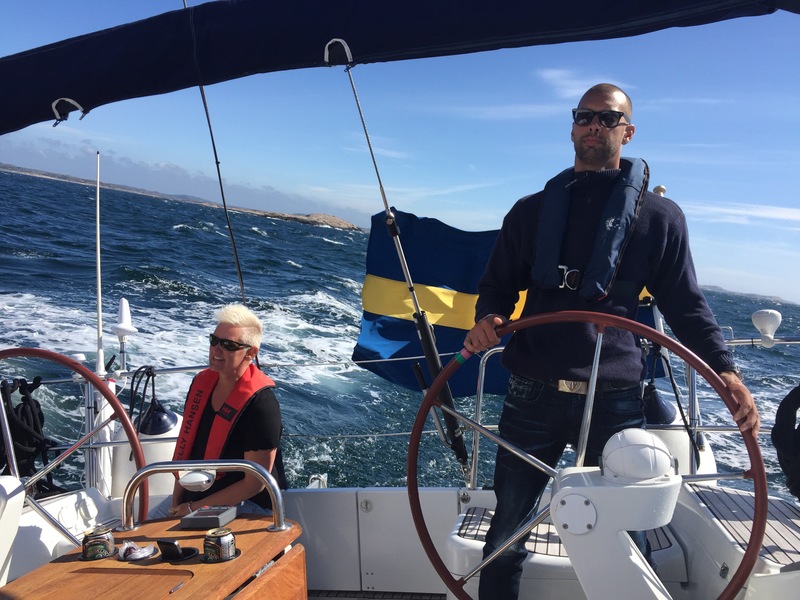 In sandefjord we called the captain who promised us a spot. Unfortunately is was on leave and the new captain did not knew about the reservation. We managed anyway. In the evening Anna and I took a walk in the city and watched the bier festival. Later in the evening we started to talk to out neighbour and it ended up with them in our cockpit talking until 00.30 and we were supposed to wake up very early for the ferry. We took the ferry to Stromstad and train to Uddevalla were Thomas picked us up and drive to Stången. We should celibate Peter turning 50. We arrived in Sandefjord at 19.30 and we went straight to the ship and relaxed longing for the arrival of Oscar and Therese the day after. Oscar and Therese should come at 12.30 and we wanted to be ready to cast of so we prepared everything from buying food to make the ship ready. As soon as they arrived we cast of and first went by engine in sandefjorden and when Turning east we could set sail towards our goal. When arriving in fredagsholet it started to rain but that did it stop Oscar from canoing and Anna and me taking a bath. Nice evening with playing yatzy and Anna become champion. 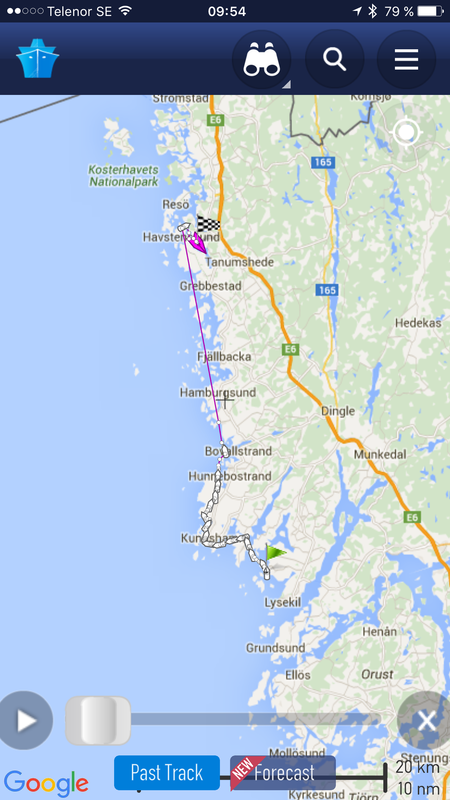 IT was a bit Windy, approx 12-13 ms from south west so we decided to go inshore towards Stromstad. We therefore set the course towards fredrikstad and when approaching fredrikstad we turned south in between the whaler islands towards west. We got pretty rough waves and when we were almost ready to turn in behind some island the engine alarm went on. Panic !! We set the genua quickly so we could stop the engine. We understood the engine had become too warm so we drive very slowly towards Stromstad. We were also very luckely to find a spot in the harbour. Oscar and Therese took the car and drove home after some relaxing in the sun. Anna and my self had a very calm evening. I started the morning with fixing the impeller and filling up the glycol as it was most likely the reason why the engine became to warm. At Reso we started the engine and drove to sannas as it was easier for Mattias, Annmarie, Ida and Ellen to park the car and join us at the boat. We thereafter when to a mooring bay were we relaxed, did some bathing, played with the rubber boat etc. A nice day doing nothing until Mattias and family suddenly realised is was important for the girls to be able to run and having more space than in the boat. 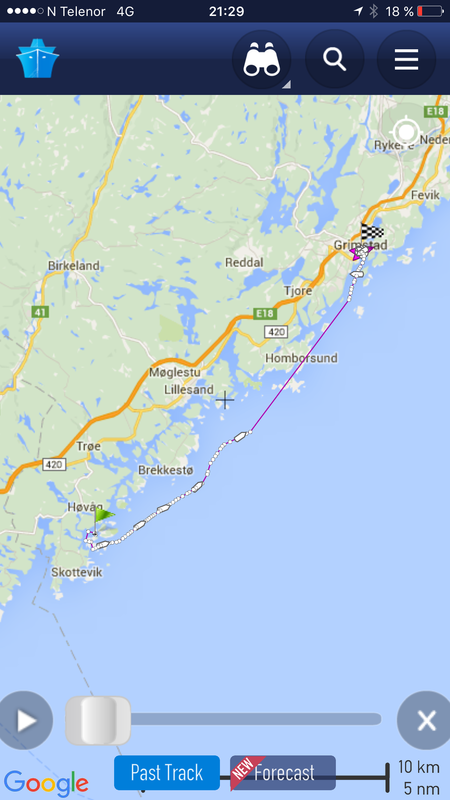 The also considered to leave us and go back to Uddevalla. I was a bit surprised but we cast of. At sannas the harbour was full so we used the anchore in the fjord even that it was a bit windy. Then suddenly the kids should take a shower – why I wondered but did not ask.gonally I had to ask if they are going to leave or not because we could not stay were we were. Than they told me it was a surprise to me and we expected more guests ;-). Annamarie came with the smart idea that we can go back to the bay we came from as there were a car road close by. Again up with the anchore and back to almost the same place again. Mattias and I used the rubber boat to find the best place to pick up the secret guests. We find a house who told us it was ok to use there pier and crossing their garden. The secret guests turn out to be Oscar, Therese, Agnes, Sebbe and Paula. They brought shrimps and crayfish so we had a nice party in the cockpit before they had to return to Uddevalla. Föregående 2-4/6 Sailing with relatives from the US.